At the International Broadcasting Convention (IBC) held every year in Amsterdam, news was the focus of some of the conferences at a time when news media organisations, broadcasters in particular, face a number of challenges from new players, social media platforms and questions about their perceived lack of credibility and balance in some countries. 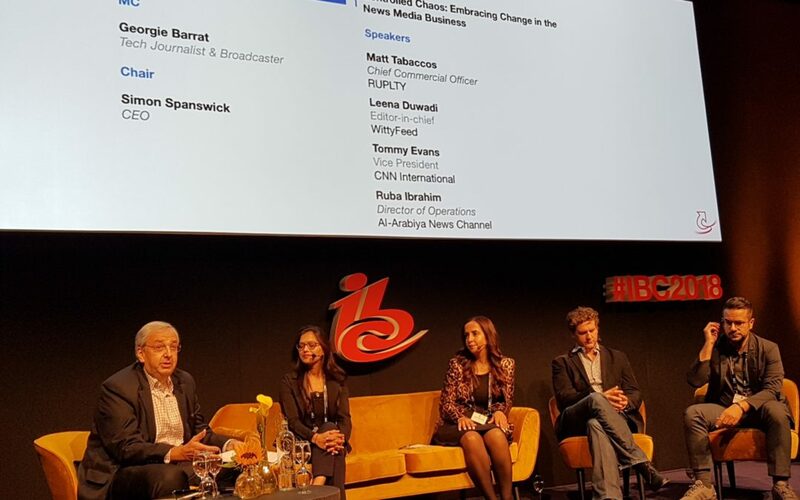 The AIB was at the centre of one of these conferences with its CEO, Simon Spanswick, chairing a session, entitled “Controlled chaos: Embracing change in the news media business”. In this meeting, senior representatives from well-established broadcast organisations as well as from relatively new players, discussed the issues they faced and how they worked to best deal with these. Panellists explained how their respective organisations were embracing media changes, both as regards the use of technological innovations, and the need to meet audience expectations. The panellists, Leena Duwadi, Editor in Chief, WittyFeed, Ruba Ibrahim, Director of Operations, Al-Arabiya News Channel, Tommy Evans, VP CNN International and Matt Tabaccos, Chief Commercial Officer, of the Ruptly video news agency, described how their organisations addressed the various issues. Ruba Ibrahim, director of operations of the Dubai-based Saudi-owned 24/7 free-to-air Al-Arabiya pan Arab News Channel launched in 2003, described the main channel and its younger “sister”, Al-Hadath, launched in 2012, which offers more in-depth, extensive coverage of political news. Al-Arabiya has an English website also and is present and very active on digital platforms and social media. Ibrahim explained how different content was tailored in content and length to meet the diverse requirements of the multiple platforms, showing examples of reports for online and mobile devices. Spanswick asked how the channels were tackling the issue of addressing audiences across the entire Arab world. Ibrahim said that Al-Arabiya was primarily targeting audiences in the Gulf area, where audiences share the same language, issues and challenges, covering news, business and sports, and offering documentaries. Following the “Arab Spring”, Al-Arabiya’s extensive, but still limited resources didn’t allow it to cover all the news across the entire Arab world, so Al-Hadath was tasked with covering more specifically news and issues about Yemen, Iraq, the Levant and North Africa. The key to success, he added, was “good content”, but he also advised for a varied and balanced mix between hard and soft news. “You can’t expect the audience to be brutalised by bad news constantly. You have to have a healthy mix of stories,” Evans warned. CNN was established as a cable news network in 1980, but gained international recognition when it was the only channel broadcasting from inside Iraq from the beginning of the first Gulf War in January 1991. CNN launched its website, CNN.com in August 1995. It is now one of the most popular news websites in the world. CNN has a wide offer of different programmes and online services that cover travel, style (arts, design fashion, architecture), health (food, health, wellness, fitness, etc. ), features (freedom project, Impact your world, Inside Africa, climate / environment issues, etc) and even a virtual reality (VR) service, CNNVR. Matt Tabaccos, Chief Commercial Officer, of the Berlin-based Ruptly video news agency, created in 2013 and owned by Russia’s RT television network, detailed the services offered by Ruptly. These include an offer of real-time and archive visual news content to all media, from broadcast networks large and small to online content providers, including broadcast, digital and mobile platforms. Ruptly value proposition, Tabaccos said, was “to try to be first, to pioneer new ways of telling stories.” Ruptly was one of the first news organisations to fly drones over war zones, which was the kind of content that resonated over the different platforms, online and broadcast, he said. “Technology has been one of our main selling points,” Tabaccos added pointing out that Ruptly now gets some 500 million views across platforms every month. The idea is to service broadcasting organisations, start-ups and ordinary users, through flexible models, he said. Tabaccos announced that Ruptly had just expanded its offer with Ruptly Pass, a “disrupting” subscription-based model “for individuals and growing media entities”, which gives users unlimited access to video and live events on the service for €12.50 a month. The “Controlled chaos” conference provided a comprehensive overview of the diverse and imaginative approaches adopted by just four media organisations with different audiences to address some of the many challenges faced by the whole broadcast news media industry today.